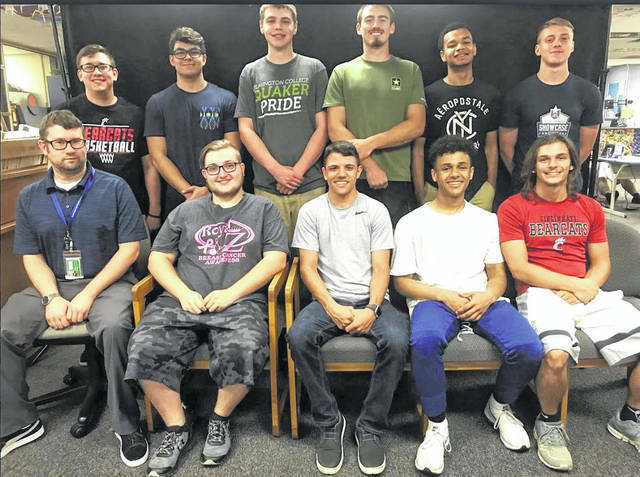 From left in the front row are Project Lead the Way instructor Chris Pope, Hunter Miller, Cameron Smart, Seth Murdock and Tony Merritt; and from left in the back row are Andrew Johnson, Adao Russo, Tristan Reiley, Matt Smith, Montel Jones and Seth Gundlach. Not pictured are Ethan Garen and Brendan Bell. WILMINGTON — Great Oaks and Wilmington High School presented career passports this week to graduating seniors of the Project Lead the Way (PLTW) engineering program. These seniors are the first group to complete three consecutive engineering courses in the program. “Even though they started as sophomores, I consider these students to be the first graduating class of the program. I am proud of the work and skills these young men have demonstrated. The career passport shows employers and colleges that a student is ready for the next level,” said PLTW instructor Chris Pope. The classes completed included Intro to Engineering Design, Principles of Engineering, and Digital Electronics. All students were able to earn some college credit by completing the courses. These are the students and their post-secondary plans: Seth Gundlach — Ohio Northern University, engineering concentration; Seth Murdock — Robert Morris University, engineering concentration; Andrew Johnson — University of Cincinnati, computer science; and Matt Smith — Wilmington College. And there also are: Adao Russo — Wright State University; Tristan Reiley — Wilmington College; Ethan Garen — Kent State University, computer science; Brendan Bell — Southern State Community College; and Montel Jones, Hunter Miller and Tony Merritt — undecided. Project Lead the Way Engineering is a satellite program of Great Oaks Career Campuses.